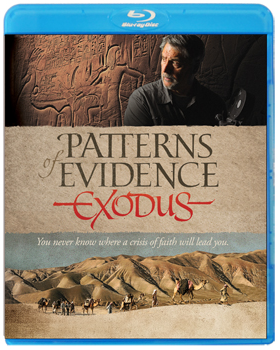 Los Angeles, Calif. (August 4, 2015) – The award-winning documentary “PATTERNS OF EVIDENCE: THE EXODUS” releases on DVD and Blu-ray today (Tuesday, August 4, 2015) through Capitol Christian Distribution along with the original motion picture soundtrack CD (July 31) and companion book (hardcover). In “PATTERNS OF EVIDENCE: THE EXODUS” Filmmaker Timothy Mahoney chronicles an in-depth archaeological investigation in Egypt and Israel as his team attempts to corroborate the biblical text. The film explores one fundamental question: Is there any evidence that the Exodus story actually happened? Twelve years in the making, this provocative documentary reveals new or rarely seen evidence regarding the Israelites’ descent into slavery, their Exodus from Egypt and their ultimate conquest of the Promised Land. Although many scholars and archaeologists deny the validity of the Exodus story for lack of proof, “PATTERNS OF EVIDENCE: THE EXODUS” builds a case that sheds new light on the story. Written, produced and directed by Mahoney along with Steven Law, Producers Peter Windahl and Diane Walker, and Executive Producer David Wessner, the DVD and Blu-ray editions highlight stunning animations and a cast including Narrator Kevin Sorbo (God’s Not Dead, Hercules: The Legendary Journeys), interviews with leading archaeologists such Israel Finkelstein, Kent Weeks, and David Rohl, and guest appearances by Israel’s Benjamin Netanyahu and Shimon Peres. Extras feature never-before-seen elements including exclusive interviews, “Behind the Music,” “From Film to Book” and information about additional books, resources and instructions on how to host a Patterns of Evidence movie event. In conjunction with the home entertainment release, “PATTERNS OF EVIDENCE: THE EXODUS” will also offer the companion book and original motion picture soundtrack CD. The self-titled soundtrack has been arranged to follow the journey of discovery. The film score is the work of three talented composers – Jonathan David Neal, David Rohl, and Rob Barrett, Jr. Between them, they were able to create a unique soundtrack that captured the world of ancient Egypt and the Bible. “PATTERNS OF EVIDENCE: THE EXODUS” (hardcover book) is written by Mahoney and Law and includes valuable insights and additional interviews not featured in the film. Filled with beautiful photography of Egypt and Israel, scenes from the biblical re-creations, maps, charts, and diagrams, it gives the reader an up-close and more in-depth look at the scholars and their positions. In the U.S., the film received accolades at over a dozen film festivals and was presented as an exclusive Fathom event this past January (2015) at over 650 theatres nationwide. Generating positive critical and editorial response, the Fathom event had sold out performances with over 85,000 moviegoers attending the event, which included an encore performance. In addition, “PATTERNS OF EVIDENCE: THE EXODUS” garnered 13 film festival awards in 2014 including, Best Director (Worldfest Houston), Best Picture (ICVM), People’s Choice Award (Magnolia International Film Festival), and Best Cinematography, Best Sound, Best Editing (RealHeart International Film Festival, Toronto), among others. Thinking Man Films and its publishing division, Thinking Man Media, are focused on creative development, production and distribution of engaging products for cinema, television, web and print. Thinking Man Films desires to gain a better understanding of significant and complex topics by exploring the world with those who are curious. The company is led by Timothy Mahoney. Capitol Christian Distribution is the market leader in Christian and Gospel music distribution and represents a diverse range of chart-topping Christian films and books reaching the US Christian and general retail marketplace, and the international Christian marketplace. Since this distribution division was launched, Capitol Christian has had more charting titles annually on Billboard’s Top Christian charts than any other Christian distributor and has been named Billboard Magazine’s Top Christian Music Distributor 15 times since 1995. In addition to distributing Capitol Christian Music Group’s fully-owned labels, which include Sparrow, Forefront, and Credential imprints, as well as Motown Gospel and Worship Together, Capitol Christian Distribution has exclusive distribution agreements with Centricity Records, City on A Hill, City of Peace Records, Difference Media, Dream Records, Gaither Music Group, Green Hill Productions, Inpop, Hillsong, Lionhawk Records, sixstepsrecords, Sonoma Music, Maranatha! Music, North Point Music, Spring Hill Music Group, Troubadour for the Lord, Universal Music Group, VSR Music Group, Advent Film Group, Alchemy, Anchor Bay Entertainment/Starz, Cinedigm Entertainment, City of Peace Films, Creative Trust Media, Exodus Cry, Ethno Graphic Media, For Our Fathers, Getty Music, Friends Media, Foreshadow Productions, Glorious Films, Guardian Studios/Bananas, JC Films, Jellyfish Labs, Ocean Avenue, Thinking Man Films, Pure Flix Entertainment, Vertical Praise Productions, Wanderlust Productions, Whitestone Media, Zayatoonz, Worthy Publishing, Authentic Publishers and many more. Capitol Christian Distribution is a division of Capitol Christian Music Group, which is part of Universal Music’s Capitol Music Group. For more information, visit www.capitolchristiandistribution.com.